Record voter turnout for the Awards. Saxony, Route 66, and Elvis Bridges in Kansas dominating the categories. Eric Delony and John Marvig honored for Lifetime Achievement. Since 2011 the Bridgehunter’s Chronicles has been hosting the Othmar H. Ammann Awards for historic bridges, focusing on successful efforts in preserving them as well as places with a wide array of historic bridges to see as a pontist, tourist, photographer, historian/teacher or a simple passer-by. In its sixth year of the awards, we saw records getting smashed for the most number of votes, let alone the lead changes that came about in some categories, complete blow-outs in others, thus making this race the most exciting and nail-biting in history. No matter which category you were watching, you probably saw your favorite going from worst to first in as many votes as in the category Best Photo, which saw votes in the thousands, plus a voting arms race among three candidates. We also saw some deadlocks for Tour Guide International, Lifetime Achievement (for second place) and Mystery Bridge, which got people wondering what characteristics led to the votes, because they must have been this good. For some that lucked out, the Author’s Choice Awards were given as consolation, which will be mentioned here as well. The MacArthur Bridge in St. Louis (Taken by Roamin Rich), Bull Creek Bridge in Kansas (Taken by Nick Schmiedeler) and the Paradiesbrücke in Zwickau, Germany (Taken by Michael Droste). Despite Zwickau’s early lead in the polls and regaining the lead for a couple days a week ago, MacArthur Bridge won the voting arms race with 38.5% of the votes, outlasting Bull Creek, which received 28.2%. Paradiesbrücke got only 16%. Devil’s Elbow Bridge in Missouri received 4.2% with fifth place going to the same person who photographed the Paradiesbrücke but in the daytime (2.2%). The remaining results can be seen here. For the next three months, the winner of the Best Photo Award will have his photos displayed on the Chronicle’s areavoices website (here) and the Chronicles’ facebook page (here), second place winner will have his photo on the Chronicles’ facebook group page (here), and the third place winner on the Chronicles’ twitter page (here). All three will also be in the Chronicles’ wordpress page (here), rotating in gallery format in the header. This category was perhaps the most watched by readers and pontists on both sides of the Atlantic Ocean, as four cities were vying for first and third place, respectively before another city decided to crash the party within a matter of only 24 hours before the polls closed, effectively deciding the winner and third place winners. Coincidence or a plot, that remains to be seen. It is known that these five bridge cities will receive further honorable mentions in the near future. The winner of this tight race was Zwickau (Saxony), Germany, which after battling with Calgary during the competition, edged the largest city in Alberta and fifth largest in Canada by a margin of 25.1% to 24%. The reason behind that was the city’s selection of the most unique bridges, one of which, the Röhrensteg, had received the Author’s Choice Award for Best Historic Bridge Finding. There is also the aforementioned Paradiesbrücke, the Zellstoff Truss Bridge and the Schedewitz Bridge, all along the Mulde River and a stone arch viaduct near the train station. The city is worth a treat. Third place winner goes to Canal Bridges in Brugges, Belgium, which went from seventh place to its final spot in less than 24 hours, knocking the River Tyne Bridges in Great Britain and the Bridges in Glauchau (Saxony) to fourth and fifth places. Brugges had 13.5% of the votes, followed by The River Tyne with 12.6% and Glauchau with 10.5%. Glauchau also received the Author’s Choice Award for its historic bridge find because of its many arch bridges that don’t span the Mulde, like in neighboring Zwickau, but along the railroad line and along the high road leading to the two castles located on the hill overlooking the river valley. Unlike in the international competition, this category proved to be no competition at all, for the Bridges of Tompkins County, New York, laden with various types of bridges dating back 150 years, including two iron truss bridges, a covered bridge and some arch bridges, left the competition in the dust. Even at the beginning of the race, it garnered an average of 92% of the votes. In the end, the county won an astounding 89.3%. The closest second place winner was the Bridges in Washington County, Maryland, which had 3.2% of the votes, edging the third place winner, The Bridges of Boone County, Iowa with 2.9%. Having lost the Wagon Wheel Bridge in December to demolition and removal after years of neglect, the Marsh rainbow arch bridges and Kate Shelley’s Viaduct could not compensate of the loss and therefore, people looked to its winner as their bridges are still in used, most of them after having been restored. Some bridges deserved to immersed in water and covered in coral, used for habitat for underwater life. Others deserved to be immersed and later exposed when the weather extremities are at their worst. The Colebrook Lake Bridge in Connecticut is one that definitely is in the second category. When Colebrook Lake was made in 1969, this Warren pony truss span with riveted connections became part of the lake bottom and a distant memory among local residents and historians. Its existence came as a surprise, thanks to a severe drought that lowered the lake to its pre-made stage and exposed this structure. Now residents and historians are finding more information on this structure while looking at ways to either reuse it or leave it for nature. Colebrook won the award in this category with 57.4% of the votes. 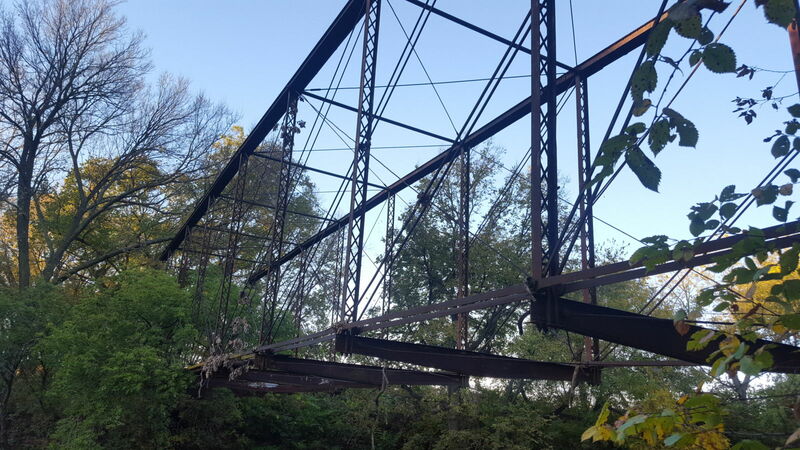 Second place went to the Marais de Cygnes Bridge in Kansas, one of the rarest Parker through truss bridges in the state, with 22.8% of the votes. Clark’s Creek Bridge, one of many Elvis bridges discovered by Nick Schmiedeler this past year, finished third with 15.4%, yet it was the winner in another category! More on that later. The remaining finishers had an average of 1.5% of the votes, which were a lot given the number of voters having gone to the polls. Australia’s historic bridges are ones that are worth traveling to visit, for many of them were built by European immigrants with ties to the bridge building and steel industries in their homeland. Only a handful were built locally. The winner and second place winners in this category come not only from the Land Down Under, but also in the state of New South Wales, which is the most populated of the states. The Prince Alfred Bridge, a nearly 150-year old wooden trestle bridge, won the race with 31.4% of the votes. This was followed by another bridge in the state, the Bowenfels Railroad Viaduct, which received 15.9% and the Ribblehead Railroad Viaduct at Yorkshire Dales in Great Britain, which got 8.7%. Tied for fourth place with 7.7% were the Isabella Bridge in Puerto Rico and the Sinking Bridge in Corinth, Greece. And sixth place finisher was the Abteibrücke in Berlin, Germany, with 6.5%, edging its inner-state competitor Röhrensteg in Zwickau and the world’s smallest drawbridge in Sanford, Nova Scotia (Canada) with 6.2% of the votes. In this category, we looked at historic bridges that were preserved for reuse after being considered redundant for the highways due to age, functional and structural deficiencies and cost of maintenance. Like in Tour Guide USA, this competition was very lopsided for a covered bridge far outgained the metal truss bridges and arch bridges in the competition. The Beaverkill Covered Bridge, built in 1865 and located in the Catskills in New York, received a full makeover, using state-of-the art technology to strengthen existing bridge parts and replacing some with those of the exact shape and size. This bridge received 62.4% of the votes. Second place finisher was the Green Bridge (a.k.a. Jackson Street and Fifth Avenue Bridge in Des Moines, Iowa. The three-span Pratt through truss bridge, built in 1898 by George E. King, received its second makeover in 20+ years in order for it to continue serving a bike trail network serving Iowa’s state capital. It received 7.1% of the votes and would have soundly won the competition had one subtracted Beaverkill’s success. Third place finisher was the former Bird Creek Bridges along Route 66 in Oklahoma. 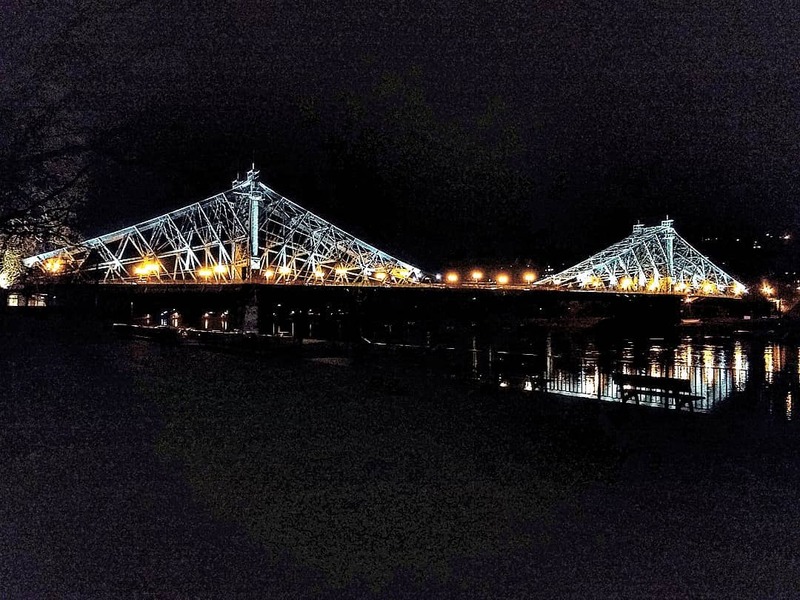 The multiple-span K-truss bridges were relocated to Molly’s Landing on one side of the highway, Roger’s Landing on the opposite end, each serving as exhibits and entrances for light traffic. Bird Creek received 6.5% of the votes. Bottoming out the top six are Wolf Road Bridge near Cleveland, Ohio with 4.2%, the County Park Bridge in Hamilton County, Indiana with 3% and Houck Iron Bridge in Putnam County, Indiana with 2.4%. Bonnie Doon Bridge in Lyon County, Iowa. Photo taken by John Marvig. For this category, we’re looking at bridges that are unique but missing information that would potentially make them historically significant and therefore, ripe for many accolades. Although the votes were made into one category, the winners have been divided up into those in the US and the structures outside the country. For the US, the top six finishers originated from Iowa, with the top two finishers originating from Lyon County. The Bonnie Doon Bridge, located along a former railroad bearing her name between Doon and Rock Rapids, won the division with 19.8% of the total votes. Not far behind is the Beloit Bridge near Canton, South Dakota, which received 13.2%. Third Place goes to a now extant Thacher through truss bridge in Everly in Clay County, which received 7.7%, 0.6% more than its fourth place finisher, the Kiwanis Railroad Bridge in Rock Valley in Sioux County. Fifth place goes to the Pontiac Lane Bridge in Harrison County, with 6.1% of the votes. Yet latest developments in the form of photos is almost bringing the Whipple through truss bridge to a close. More later. In sixth place, we have a concrete arch viaduct built by H.E. Dudley near Richmond in Washington County, with 5.5% of the votes. According to John Marvig, that case was recently brought to a close as the now extant bridge was replaced with a steel girder viaduct in 1947. All of our entries for the international aspect of mystery bridges were from Germany, specifically, the states of Thuringia, Saxony, Saxony-Anhalt and Brandenburg. Our first place finisher goes to the concrete camelback pony arch bridge near Altenburg. That structure was built between 1900 and 1920 and still retains its original form. Second place goes to the railroad viaduct in Grosskorbetha, located near Bad Durremberg in Saxony-Anhalt. The 1910 arch structure used to serve a local road to Wengelsdorf, but was removed in November this year, as the German Railways plan to modernize the Y-point where the raillines split to Leipzig and Halle from the south. The Railway Station Bridge in Halle finished in third, followed by an unusual wire truss bridge in Potsdam and finally, the truss bridge at Schkopau Station, south of Halle. The category Bridge of the Year goes out to bridges that made waves in the headlines because of (successful) attempts of restoring them, as well as interesting findings. Our top six finishers in this year’s category consists of those by Julie Bowers and crew at BACH Steel, Elvis Bridge finder Nick Schmiedeler and those along Route 66. Clark’s Creek Bridge in Kansas came out the winner with 53.4% of the votes. This bridge was discovered by Schmiedeler and was one of the first bridges that were dubbed Elvis Bridges, meaning these bridges had been abandoned and hidden under vegetation for many decades. Clark’s Creek is a King Bridge product having been built in 1876. Second place finisher is the Springfield Bowstring Arch Bridge with 18.1% of the vote. Thanks to Julie’s efforts, this 1870s structure is expected to be restored, relocated to a park and reused after years sitting abandoned, leaning to one side. Third place finisher is the Times Beach Bridge spanning the Meramec River along Route 66 west of St. Louis, with 6.9% of the votes. This bridge was a subject of fundraising efforts to be restored as part of the Route 66 State Park Complex and bike trail. The bridge was recently given a reprieve from demolition by Missouri Dept. of Transportation. More later. Rounding off the top six include Gasconade Bridge along Route 66 with 5.4%, Hayden Bridge in Oregon, another project by BACH, with 4.9% and Fehmarn Bridge in Germany with 3.2%. Word has gotten out that the sixth place finisher will receive a rehabilitation job, which will prolong its life by 30 years and keep its symbol as the icon of Fehmarn Island. Our last category for the 2016 Ammann Awards is for Lifetime Achievement. Unlike this year, there are two winners for this prize, one emeritus and one who is the youngest to win the awards. Eric Delony, who spearheaded efforts in preserving historic bridges through a nationwide program and was director of HABS-HAER for 32 years, received the Lifetime Achievement Emeritus Award. More on his work can be seen here. John Marvig became the youngest pontist to win the Lifetime Achievement thanks to his efforts in identifying, photographing and working with authorities in preserving railroad bridges in the northern part of the US. Since having his website in 2010, his focus went from railroad bridges in Minnesota and Iowa to as many as 9 states. The freshman at Iowa State University received 49.3% of the votes, outfoxing the second place finishers, Royce and Bobette Haley as well as Nick Schmiedeler. Christopher Marston finished fourth with 5.4% of the votes, which was followed by Ian Heigh (4%), Kaitlin O’shea (3.5%) and BACH Steel (2.9%). And with that comes the closing of one of the most intensive competitions involving historic bridges in the history of the Ammann Awards. It was one that got everyone excited from start to finish, and for many bridges, there is a ray of hope in their future as more and more officials and the communities have become interested in preserving what is left of their history for the younger generations to enjoy. For some profiled that have a questionable future, not to worry. If one person refuses to preserve, another one will step up in his place, just like the electors in the US elections. The interest in historic bridges is there and growing. And that will continue with no interruptions of any kind. The full results of the Ammann Award results can be found in the Chronicles’ wordpress page by clicking here. Note there are two parts just like the ballots themselves. The links to the pages are also there for you to click on. This is the last entry carrying the Jacob slogan. Since September 2016 the Chronicles has been carrying the slogan in memory of Jacob Wetterling, an 11-year old boy who was kidnapped on 22 October, 1989 and subsequentially murdered. His remains were discovered in September 2016 bringing a 27-year old case to a close. The murderer has since been sentenced to 20 years in prison with a lifetime incarceration in a state mental hospital to follow. His house was demolished on Christmas Day. As the murder happened closer to home (the author originates from Minnesota), the Chronicles started its Ammann Awards nominations early and carried this unique slogan in his memory. To his parents and friends, he will be remembered as a boy with dreams that never came true, yet he came home to rest and now is the time to bridge the gaps among friends, family and acquaintences, while keeping in mind, dreams can come true only if we let them, and help them along the way to fulfilling them with success and respect. 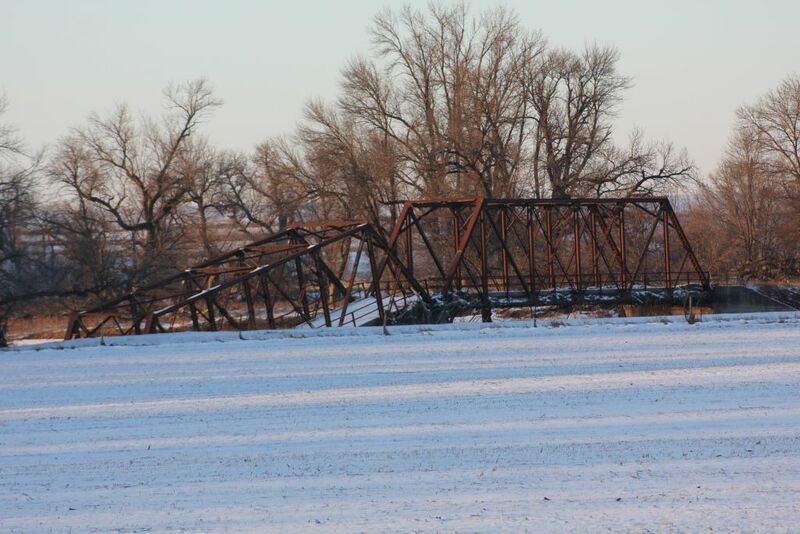 our kiddos grew up on that bridge going to gma’s house and used it for many farming years!